Parliament na mBán is an ongoing project centring on a hand written book in my possession. 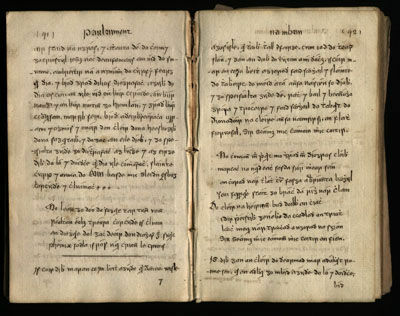 The book is called Parliament na mBán (Womans' Parliament) and is a hand written text in Old Irish written originally in 1670 by Domhnal O' Comlmain and transcribed in 1882 . I am an Irish speaker but as this book is old I am unable to read this text. This is of interest to me in terms of exploring qualities of language. The work is an attempt to explore the nature of language and the ways it is interpreted. I am interested in the idea of text rendering images visible through narrative, and images rendering text visible through context. I have done several things to try to manifest these ideas. 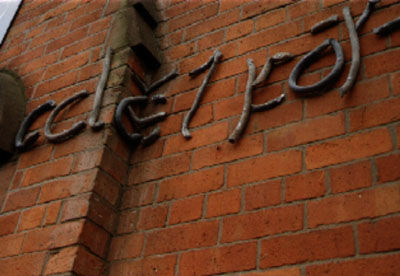 The project manifests itself in various forms using the CúlturLann as a focal point, as this institution is dedicated to the promotion and exploration of all aspects of the Irish language. The book was exhibited here to publicise its' existence and to try and generate some debate. This tactic was sucessful as Ionrai de Paor, an historian with Queens University has now borrowed it to conduct research into it and the scribe who made it. Hopefully this research can be used to generate contemporary debate around it as an historical object. I have taken a line of text from the book that concerns itself with the education of women and their possible role in military affairs as it is both archaic and current. 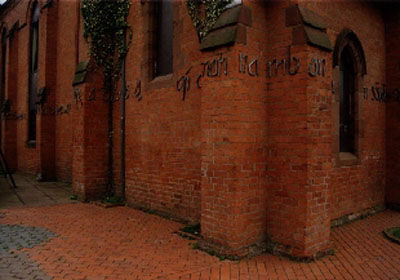 I have reproduced this text in lead letters made of salvaged piping on the wall of the Cúlturlann. I have also produced an edition of bookmarks derived from the book. These are available in the Cúlturlanns bookshop.